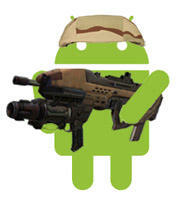 And yes, i know you cant actually play a real shooter on a phone (its a phone not a PC :) ), but still it's cool. I have tried out several ports for Q3A for Android and loading Urt as a mod with these. There also seems to be a direct port of ioq3ut4 or something like that, but the website is a little confusing (and not only the format). It also requires a SMS to be send and some other things i don't really trust and want to try. to run any of the ports i tried you need a copy of Quake 3 Arena with the 1.32 patch. Luckily q3ademo and the patch is enough so its still free. There you got your pak0.pk3 !! Now that you have all the files needed you need a q3config.cfg which will allow you to run Urban Terror. From your UrbanTerror installation get the zpak000.pk3 , zpak000_assets.pk3 and zpak001_assets.pk3 to the directory just created. From your UrbanTerror installation get all zUrT42_*.pk3 files (1-18 + qvm @ 4.2.009)to the directory just created. Hurray! Now you are ready to install a q3 port to your Android device and run it! Now you are running UrT as a mod, however it might look like. Probably like this, or like the UrT standard main menu, if the mod is able to load it. Some Ports don't have a console button but are able to load the Urt main menu (qiii4a and Open Arena). To "get" a console anyway you need a button which toggles it. 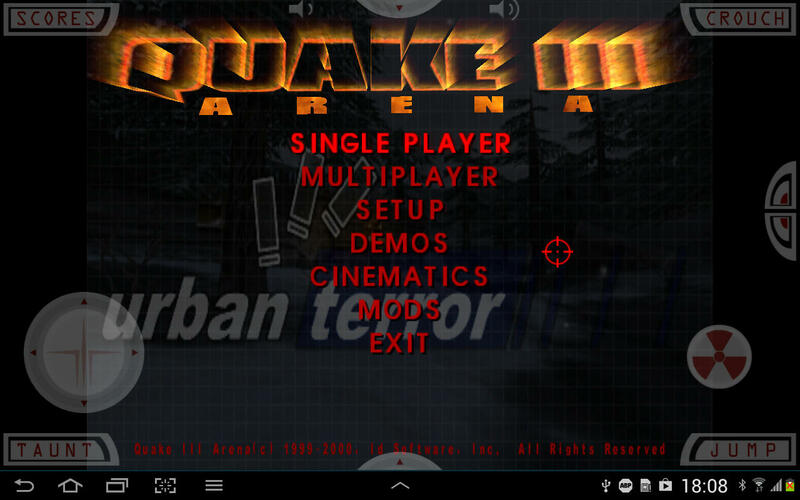 kwaak3 runs Q3A so you can load Urban Terror as a mod via the mod menu. It is not able to load the ioq3ut4 menu, but you can join servers via the server browser which will show UrT servers when you got it loaded. kwaak3 has no console, which makes setup a little difficult. While connecting to a server you don't get a loading screen, it only shows a Q3 "connecting..." message. But don't be worried. It will connect. While in-game you have the whole IG UI so you can do your settings there. press ESC (back) to get the menubar. The movement controls can be placed freely via just touching the screen, which can get quite irritating. Just like kwaak3 but with a console button in top mid of the UI. Onscreen-controls are visible all the time, even in the main menu, but are static. Controls of the menu mostly work via the onscreen-gamepads (or arrows on a keyboard, because the onscreen-gamepad actually only presses these). This make setup a little difficult. Shooting and viewing doesn't work together with walking, since you would fire all the time. Here is a video of what it looks like. I didnt manage to get the main menu, but i could use the touchscreen instead of pressing down arrows until you get the button you want. Open Arena is a Conversion of Quake3, which still can load mods. Open Arena manages to load the Urban Terror main menu but has no console. I managed to "get" one with a modded main menu. It didn't show, but you could type to it via an onscreen button. But that is about everything good about it, since you get a malloc fail whenever you try to play local and a network error if you try to connect online via console. Also the Serverbrowser doesn't work. After installing it will download all the files it needs. You could also move the directory from step 5, which will save to the space on your SDcard and the copying time, but disallow you to run anyother port without moving the files back. Now open the app again and run UrT as a mod. qiii4a is able to load the Urban Terror main menu but has no console button. Still, my modded main menu with a button for it make it drop down. while in main menu (or write it to your q3config) I will also include this to the q3config for android provided in this article. The Server browser works correctly. Only thing is that the touchscreen mouse isn't absolute to the screen. But you learn to work with that in less than a minute. My absolute favorite is qiii4a since it can run any function of UrT. Since it also lets you choose an game directory you dont need to place all the files for UrT and Q3A in your internal SDcard. On top of that it is the only app/port freely availibe on the playstore (except Open Arena, which can't run UrT). All the other ports have to be downloaded elsewhere manually. no no yes yes ? ? ? needs additional button ? ? ? maybe hex values work for others ? ? ? no q3a browser, showing UrT servers no UrT browser ? ? ? modded menu ? ? ? maybe? yes no yes ? ? ? creates problems good ? good ? ? ? 0 + - ++ ? ? ?